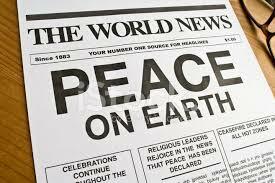 Peace on Earth: Can it Be? 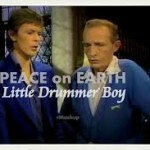 and David Bowie singing “Little Drummer Boy”. While Bing sings the traditional “Come they told me….” David sings a harmony “Peace on earth, can it be?” It is a powerful song, but also it is a question we all have in our hearts, especially this time of year. “Peace on Earth, Can it Be?” Yes, it can be! 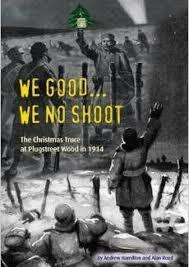 It really happened, on Christmas Day, in 1914, during WWI! 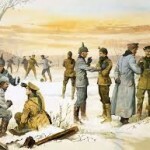 It is known as the Christmas Truce, where troops on opposing sides of battle, spontaneously moved by the singing of Christmas songs, put down their weapons, defied their commander’s orders, and walked out to greet each other, share brandy, sing more Christmas songs together, share photos of loved ones, and they even played soccer together! The next day they went back to the work of war, but for that one Christmas Day in 1914, the Light of the Christ Child brought Peace on Earth, and was proof, that what the Angels sang two thousand years ago; “Glory to God in the highest; peace on earth peace to People of Good Will!”, really can happen. of armed enemy troops, carrying a truce flag, that looked “Like the Christmas Star, shone on that plain so bright, as he bravely strode unarmed into the night”. Because of his courageous walk, others followed, and the Christmas Truce, and gathering of soldiers occurred. Peace really can happen. It is what all “People of Good Will” really want. But before it can happen for the many, a few must boldly live it, like that young man who walked unarmed into the midst of the battle, bearing the Light of Christ, like “The Christmas Star”. This is what joining the Franciscan Order is. To strip oneself of all the “weapons” of the world as we know it; to strip ourselves of power, wealth, dominance, to be humble and poor and obedient, and walk unarmed into the world, bringing the light of Christ to others. In the days of St. Francis, there had been years of ongoing wars in the feudal system of Europe. Francis, a man of peace, who saw all people and creation as brothers and sisters, began the order of Franciscan Men, called the first order. St. Clare followed his example, and began the second order, for women. But less is spoken and known about the third order; married and single people, who from their homes, professed the rule of St. Francis, and vowed to live the Gospel more visibly “in the world”. One of the Rules of the Third Order Franciscans, was that a Franciscan should not carry arms. That meant, they could not enter into war as a soldier. It turns out, that many lay people, especially the surfs, refused to carry arms and fight for their Lords. Because so many refused to fight, the feudal system in Europe broke down, and some historians credit Franciscans with having a large role in bringing about a time of Peace to Assisi, and eventually, much of Europe. 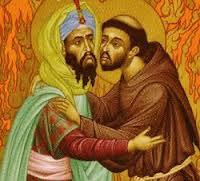 Francis also during the Crusades, risked his life to go to the Sultan to make peace. Although unsuccessful, he was received respectfully and was given an audience with the Sultan. Do you believe there can be Peace on Earth? The Angels tell us their certainly can. Will there be? Well, that is up to us! We cannot make others live in peace, but like those soldiers who on that one Christmas Day in 1914, who defied the ways of the world, and decided to live peace, we too can put down our weapons, and live in peace. Who knows, like the Christmas star was followed by the wise men 2,000 years ago, the wise people of today, people “Of Good Will”, may also follow, and it may bring Peace to Earth. Are you willing to try? Follow the links on the Franciscan Life page of this site, or contact me to learn more about the Franciscan Order. 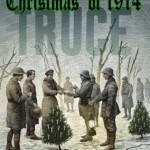 Click on the images to hear: Peace on Earth, Little Drummer Boy, read about the Christmas Truce, or listen to the song “Christmas in the Trenches”. 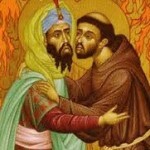 Previous Post Honoring Our Two Latest Franciscan Martyrs: All Franciscans Strive to be Martyrs!